Wearing elastics (or rubber bands) improves the fit of your upper and lower teeth. Rubber bands work far more efficiently if they’re worn as prescribed. Headgear is used to treat patients whose teeth are in an overbite, with the upper jaw forward of the lower jaw. 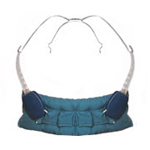 Headgear gently “pulls” on your teeth to restrict further forward growth of your upper teeth and jaw. The palatal expander “expands” (or widens) your upper jaw by putting gentle pressure on your upper molars each time an adjustment is made. Dr. Henao will instruct you about when and how to adjust your expander. When you achieve the desired expansion, you will wear the appliance for several months to solidify the expansion and to prevent regression. 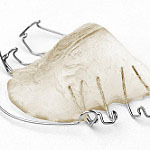 The Forsus Fatigue Resistant Device, or “bite springs” are one of the latest in technology for correcting class II bite problems. The Forsus appliance is used in order to help move the upper molars back while moving the lower arch forward. Composed of a spring-coil rod, the appliance is used you wear braces. It runs from the upper first molar band down to the lower archwire. Facemask is an appliance used to reduce and correct the discrepancy when the lower jaw is ahead of the upper one. The concept behind this appliance is to utilize the flexibility of the sutures of the upper jaw and pull it forward, thus reducing or eliminating the underbite. It is usually combined with an expander to widen the upper jaw. 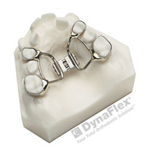 The Carriere Distalizer is an orthodontic device that was developed to correct a bite without removing permanent teeth after teeth have erupted incorrectly. It has an effect similar to headgear, but without the use of a bulky appliance: the Carriere Distalizer pushes upper teeth back to create a corrected bite prior to the addition of braces. Treatment with the Carriere® Motion™ Appliance typically takes four to six months, which cuts significant amounts of time off traditional orthodontic procedures, so it delivers highly visible results quickly. The lower lingual holding arch is a holding appliance. It prevents the permanent molars from shifting forward, which allows eruption of permanent teeth. It remains in place until permanent teeth begin to appear. When a primary tooth is lost prematurely, the teeth can drift into the new space and crowd out the permanent tooth that is supposed to emerge into that space in the future. A space maintainer keeps baby or permanent teeth from shifting into the space where the tooth was lost so a permanent tooth can appear in its natural and proper space. TADs are temporarily inserted into the jaw bone to resist unwanted tooth movements during orthodontic treatment. These devices are used only in select cases. They allow for tooth movements that were not possible before.